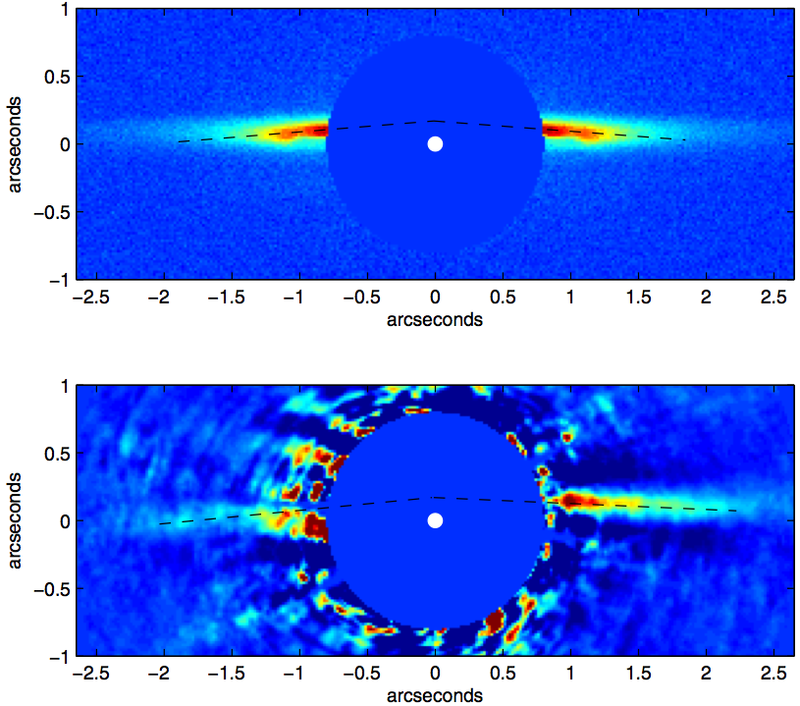 Model (top) and observed (bottom) infrared images of the debris disk around HD 15115. From Rodigas+ (2012). Great talk today in the astronomy seminar from our own Dr. Timothy Rodigas. Dr. Rodigas talked about several topics related to debris disks around stars. The colors and shapes of these disks can tell us about the compositions of planet-forming materials around the host stars and about the possible presence of otherwise unseen planets. 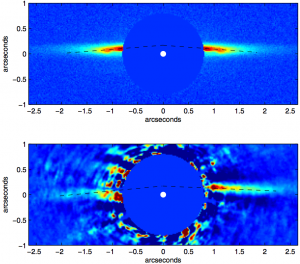 Without any planets in the system, debris disks are thought to take on very simple shapes, so if an astronomer finds a disk that warped or asymmetric, that can be evidence for a planet gravitationally sculpting the disk. Dr. Rodigas presented the results of theoretical calculations that showed how the width of a sculpted debris disk can be used to put an upper limit on the mass of a planetary companion — very useful if you’re an astronomer trying to decide where to look for planets.